Seasons 2010-2017 at Hala Sultan Tekke, Cyprus, published! The main task of the excavations in 2011 was to expose more of the Iron Age I compound which was discovered in 2009. 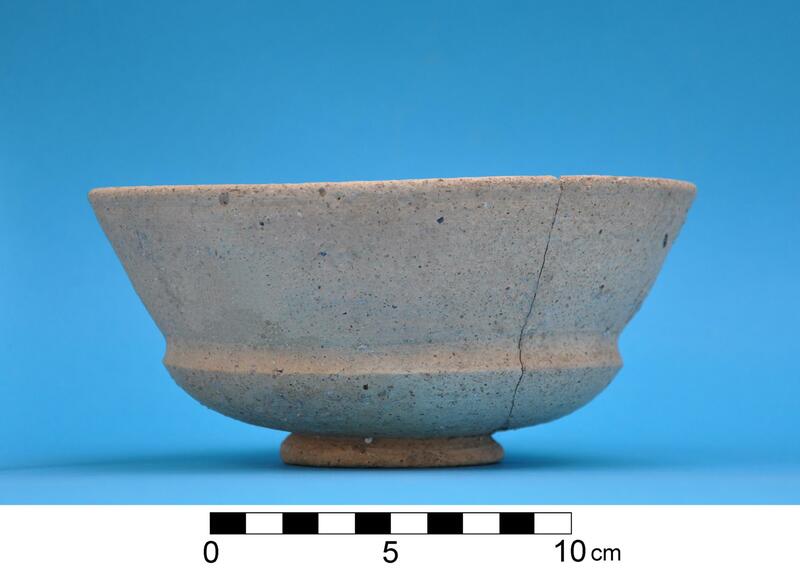 Nevertheless, we discovered also fairly intact Late and Early Bronze Age contexts. The 2011 team consisted of 28 persons including P. M. Fischer (director), T. Bürge (assistant field director), H. Ta’ani (foreman, trench master), M. Al-Bataineh (surveyor, draughtsperson). Trench masters were S. Ahmed, D. Blattner, C. Böhm, R. Feldbacher, F. Lukscheiter and S. Scherzer. A. Pihl was assistant trench master during the second half of the campaign. The representative of the Department of Antiquities was Z. Ghnaimat. The expedition was further backed up by the inspector of Pella, N. Khasawneh. Additional support was provided by S. Esbeihat (cook). The brothers Y. (pottery washing) and S. Suleiman Musa (transportation) assisted. 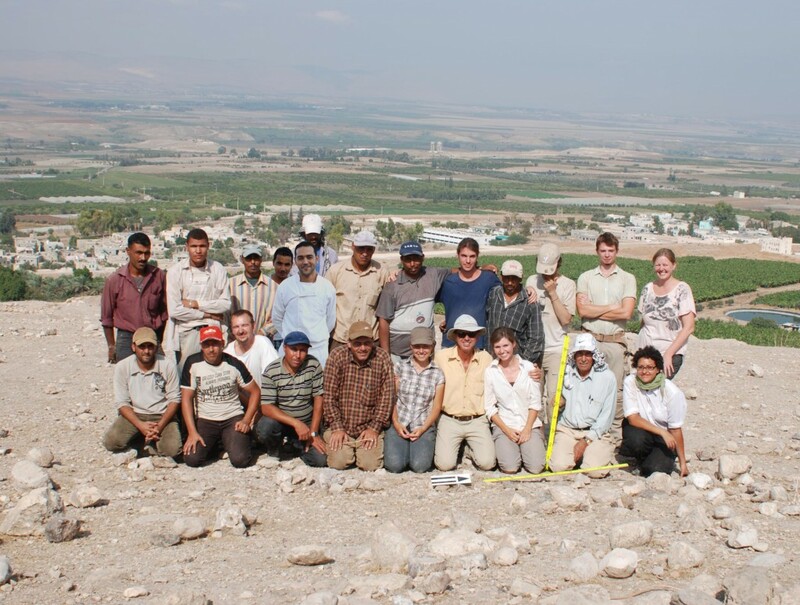 Twelve local workers from Pella, Mashare´a and Yabis were engaged in the excavations. The Royal Court, represented by T.R.H. Prince Raad Ibn Zaid and Princess Majda Raad, and the Swedish Embassy headed by H.E. C. Sparre again showed interest in our work and provided support. 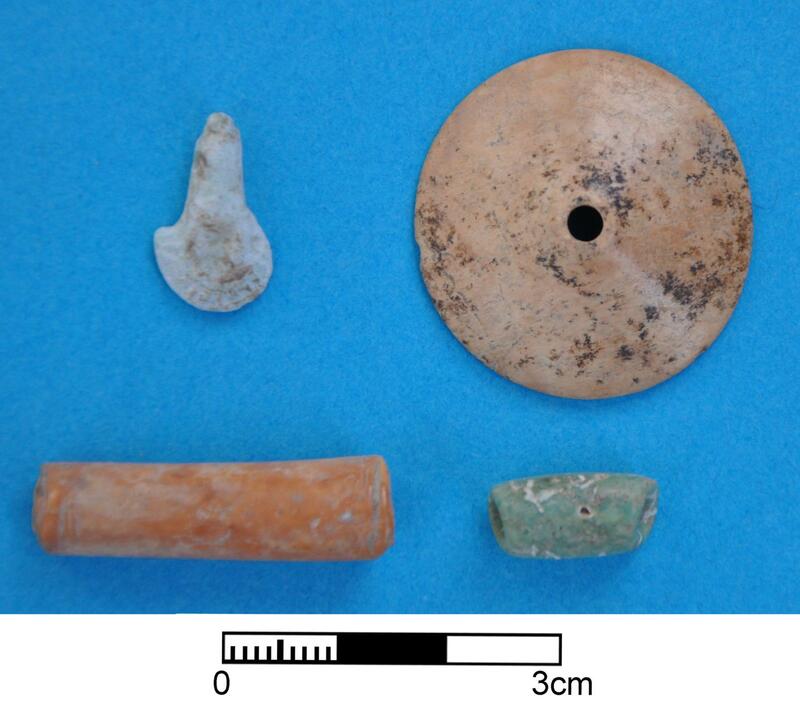 – radiocarbon samples from Early Iron Age contexts. The architectural remains of two occupational phases, most of them just below a thin layer of colluvial soil, were relatively well-preserved despite their superficial positions. There is a structure consisting of two rooms to the north. Two windows, each 1 m wide, open up the rooms to the south, viz. towards where the Wadi al-Yabesh flows. This structure was clearly built in two phases (Stratum 0A and B): the lower part is well-constructed of relatively small rounded stones whereas the upper part is built of large blocks of stone, obviously deriving from the collapsed “White Building” to the north which represents an Iron Age tower that was reused during later periods. South of this structure is a courtyard where numerous vessels were found. A staircase leads towards the east and a bench is built along a 1 m wide wall, W653. There are two spaces and a bench against this wall to the south (W654, 655, 658). To judge from the pottery the building was used in Byzantine (Stratum 0B) and later on in Abbasid (Stratum 0A) times. 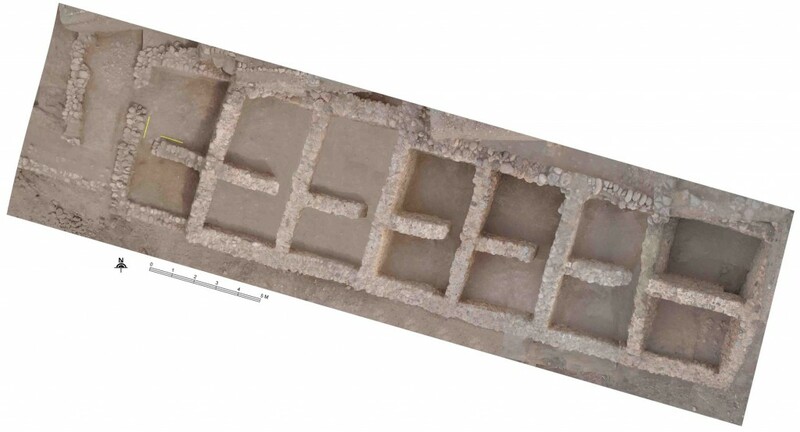 This occupation layer is related to the corresponding stratum from the excavations in 2010. There are additional spaces to the north and west, the function of which is not totally clear: they most likely represent a courtyard and another domestic area. 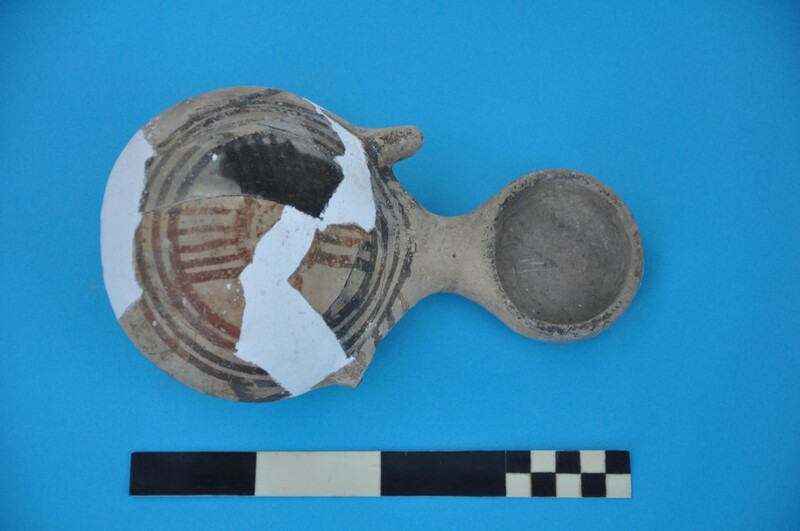 The majority of the sherds are from the second part of the Iron Age but a few intrusive sherds dating from the late Roman/Byzantine and Abbasid periods were also found. There are no other finds of chronological significance. Only a few loci and some walls were exposed before the excavations came to a halt. According to the pottery and radiocarbon this stratum belongs to the end of Iron Age I or possibly the beginning of Iron Age II. A test trench was dug north of W649 (see website 2010). 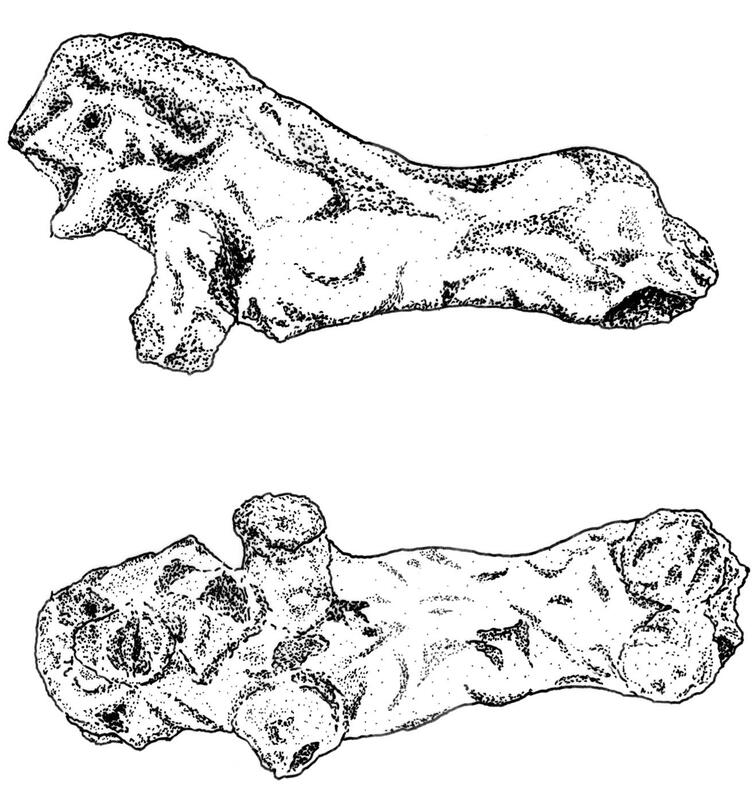 Finds of interest were four skeletons: the uppermost was only partially preserved whereas the lower three were almost complete. Two of them seem to embrace each other. One young female had an earring of bronze close to her left processus mastoideus. 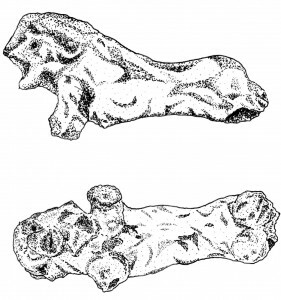 There was also a collared bead of bone amongst the bones. Our interpretation of the find circumstances rules out a tomb but suggests instead that we are dealing with earthquake victims. The date of this event is placed in the Late Bronze Age on the evidence of a few associated pottery sherds. Below the skeletons we reached a mudbrick wall, below which had been built directly upon bedrock. The level of the bedrock is -3.13 m which demonstrates that there is a natural terrace just above the Iron Age I (Stratum 1C) compound to the south (the floor level of Stratum 1C just 2 m to the south is -4.60 m). 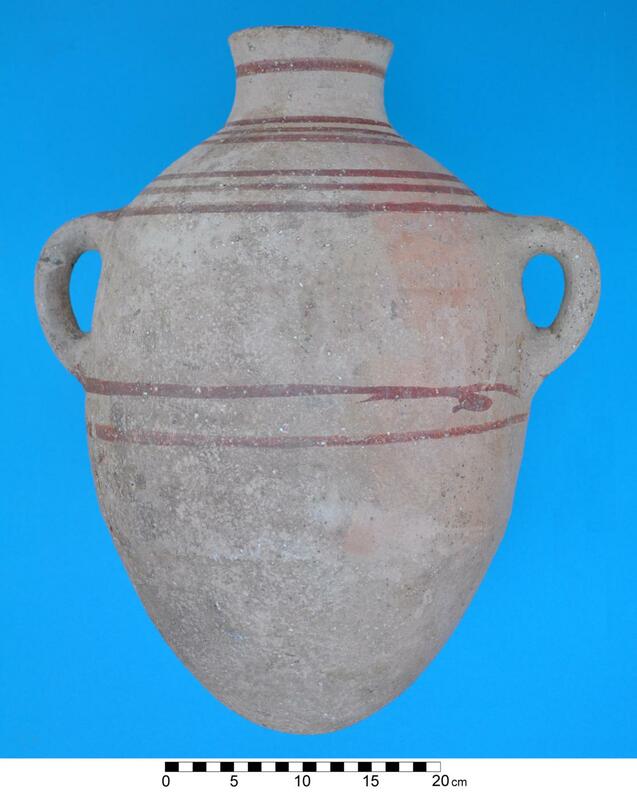 The pottery is exclusively Early Bronze Age. A partly exposed wall and two tawabeen, which were built close together, belong to this phase of occupation. The northern one, approximately 0.7 m in diameter, is well-constructed and stands on a stone bench. Larger stones in front of the tawabeen were used as working surfaces. Pottery points to a date in Iron Age II. A long wall (W613), running east-west, and other poorly preserved walls, together with a tabun, belong to this phase. Dating from the pottery is not unambiguous, but a date around Iron I/IIA is suggested. Room 1 belongs to the Iron I compound, which was partly excavated in 2009-2010. This room is one of the three rooms that were looted after the 2009 season. The southern part was totally emptied by the looters whereas the northern part was partly intact. A depot of fine clay in the eastern part of the room and several broken unfired vessels point to the production of pottery or at least the storage of unfired vessels and raw material. This room contained a considerable amount of charcoaled wood possibly indicating wooden shelves where the unfired vessels were stored. Samples from wooden posts were sent to the Cornell Tree Ring Laboratory, Cornell University, USA. 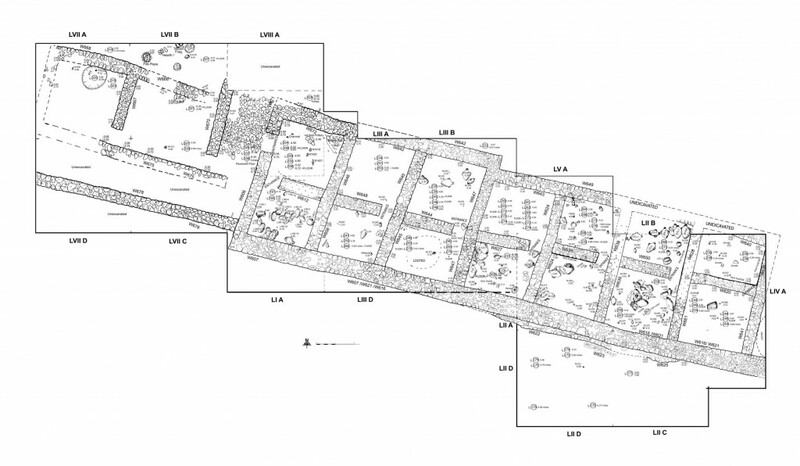 Room 1 is the only one of the 14 rooms hitherto excavated that has two entrances: the “standard” opening between Rooms 1 and 2, but here in the western part, which contrasts with the other 12 excavated rooms, where the openings are always to the east. The second entrance, which is the only one so far from the outside of the building, is 1 m wide. The irregularity of the corner stones may possibly imply that this “entrance” was opened after the destruction of the compound. Amongst the finds from Room 1 are: a stone pestle, a basalt weight (?) with a cylindrical depression at the bottom, a spearhead and a vessel of alabaster/calcite from which the neck and rim are missing (N1423). West of the compound is another complex with a different layout but with an identical direction of the walls. This complex comprises at least six rooms with several hearths. An unusual find was made just to the north of W668, namely a fired clay figurine of a lion (N1424). There are no architectural remains which could be ascribed with any certainty to the Late Bronze Age. 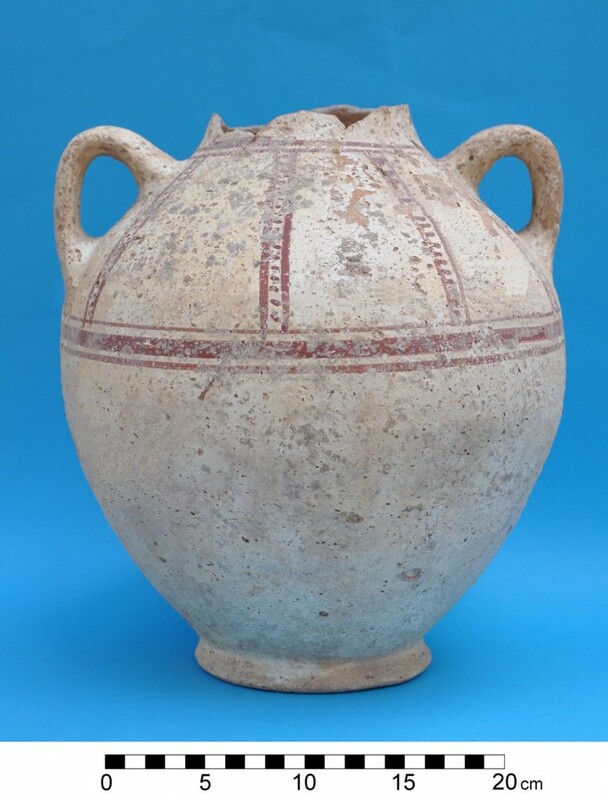 There are, nevertheless, impressive vessels of Chocolate-on-White Ware and other wares that clearly belong to the Late Bronze Age and most likely to the destruction layer of Phase V which is dated to after 1450 BCE. A few walls (W676 and 677) with associated Early Bronze Age pottery were exposed at the end of the 2011 season of excavation in the most south-westerly part of the opened area. Related to these walls were Hole-mouth jars and Metallic Ware (burnished) juglets of a type which has been traced petrographically to the Mt. Hermon area in southern Lebanon. One of the Metallic Ware juglets is a new type at Tall Abu al-Kharaz. This layer of occupation belongs either to Phase II or III (both Early Bronze Age II) according to the internal phasing at Tall Abu al-Kharaz. It seems that the Iron Age I compound does not continue to the north where there are post-Iron Age remains (Byzantine and Abbasid; the city wall is to the south). We exposed the western limits of the Iron Age I compound. The hitherto exposed compound measures 28 m in the east-west direction. Its architecture is quite unique amongst Early Iron Age buildings. To the west of the Iron Age compound were numerous fairly intact contexts of Late Bronze Age date. To the north of the compound four skeletons, most likely earthquake victims from the Late Bronze Age were discovered. 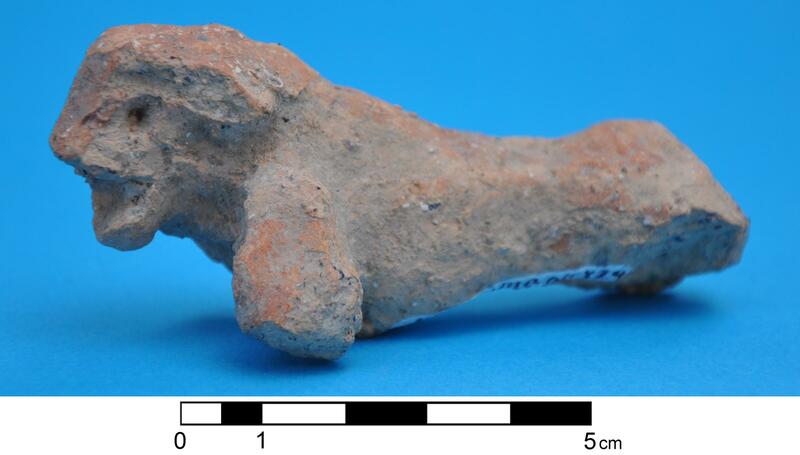 We could also expose some intact Early Bronze Age contexts fairly close to surface. Guarding of the site has been granted by the Department of Antiquities, which will facilitate the continuation of the project. Consolidation of the well-preserved architectural remains has high priority and has been carried out on the majority of the exposed walls. Further investigations of Area 9 will take place in the future.